Although the sun is out and shining brightly – maybe too brightly – the rainy weather is coming. The snowy weather won’t be far behind. Your yard deserves a fence that can stand up to this unpredictable weather; a privacy and cosmetic solution that will stand the test of time, a vinyl fence. 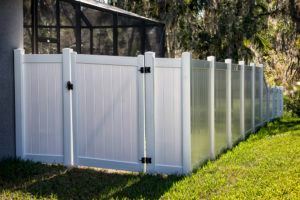 The Vinyl fence market is catching and outpacing most other fence types and for good reason too! The initial start up cost saves you money in the long run with low maintenance costs. An occasional spraying and maybe a wipe down or two, and your fence is back to looking great! Vinyl Fences are an incredible solution for your privacy and yard. Vinyl Fences are truly a low maintenance and versatile option that has everybody ecstatic! Some people are put off by the initial cost. Wooden fences are obviously the cheaper option right? Not really! Wooden fences have a lower initial cost but they require maintenance and that cost quickly adds up. Vinyl Fences don’t have those same maintenance costs, so you pay up front and you’re done! You can be confident that you will save money in the long run. Besides, you don’t even need a hammer and nails to put boards back in place with vinyl fences!